Dealer Management Software. Auto, Moto, RV, Marine, And Any Specialty! Any Dealer Specialty. Trusted by thousands of dealerships. 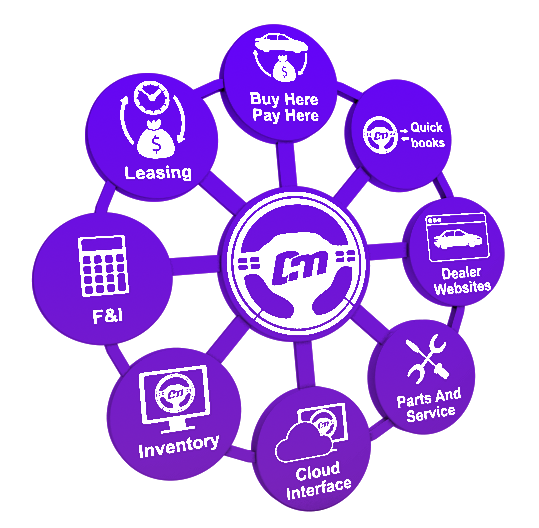 Easily Manage Your Inventory, Sales, Financing, Accounting, Parts & Service, Customers, Web marketing and Websites and much more with our complete and comprehensive Auto Dealer Management Software. Dealer-Mate is a great fit for Any Dealer Specialty. No matter what type of Dealership you are running, our Dealer Management Software includes all the necessary modules and features. Dealer-Mate is fully working, easy to use, and market tested on thousands of dealers to deliver bug-free software. Dealer-Mate can be used as Car Dealer Software, Motorcycle Dealer Software, RV Dealer Software, Heavy Truck Dealer Software, Boat Dealer Software, and any type of equipment dealer software. Vitt Auto Group has been using dealer-mate for few year now and we love this DMS software and rely on this system and dealer-mate support daily! I would recommend this company to any dealer without hesitation. Black Label Auto Group would recommend Deal-Mate highly. The installation went very smooth and the follow up support has been outstanding. Any issues that come up are corrected promptly. Our dealership started using Dealer-mate in 2001, that is 16 years ago! Wow! I would recommend this software to any dealership that is just starting business or would like to step up to the next level, its affordable and works great! Fill out form below or contact us at (323) 525-0747.